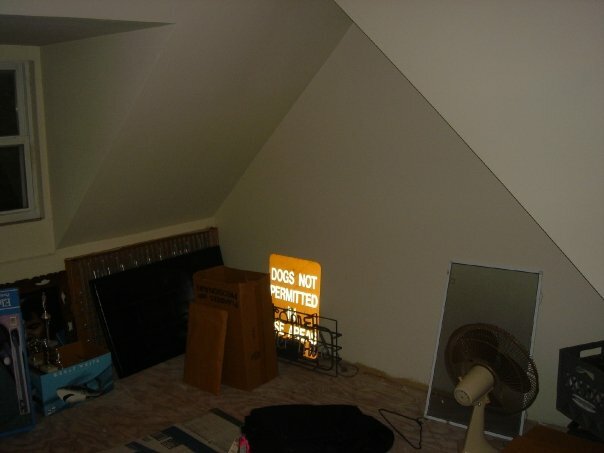 Here are some noteworthy pics from a job, an attic remodel before and after, I did with my friend John S. When I say “with” — I mean “with”. He and I worked part time on it for several months. 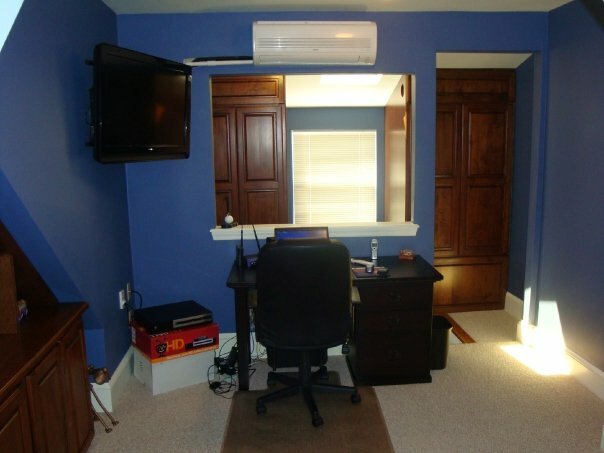 John had this great space in his attic that he wanted to convert into a home office. The space was already pretty well complete i.e. subfloor down, drywall finished, etc., but for years he had difficulty finding a good contractor to wrap up the whole thing. There were some inherent challenges with this project. 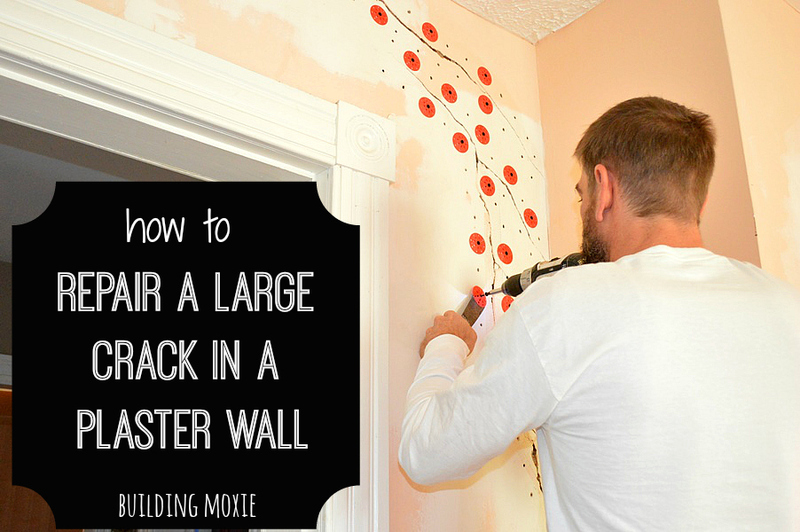 First, there was a set of attic pull down stairs, you know the kind; he, of course, wanted something a little more permanent in place. Second, and to complicate matters, the home’s heating/cooling unit sat in the attic immediately to the left of the opening. A knee wall sat immediately to the right. 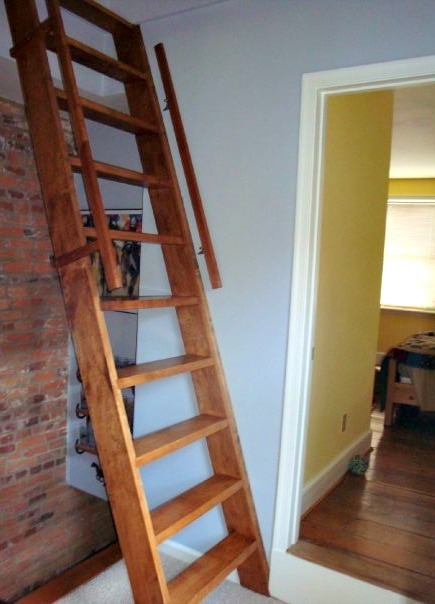 The end result, and if you consider the hallway below — not much room in which to fit a staircase. Let me point out that John functions as a high level homeowner. He does his research. 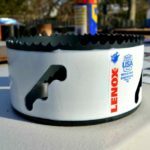 He is capable of most home maintenance tasks. I have watched him work, and he does right by his investment. For this job, though, I tried initially to hook him up with a guy I knew. That just didn’t work; that dude ended up bailing. 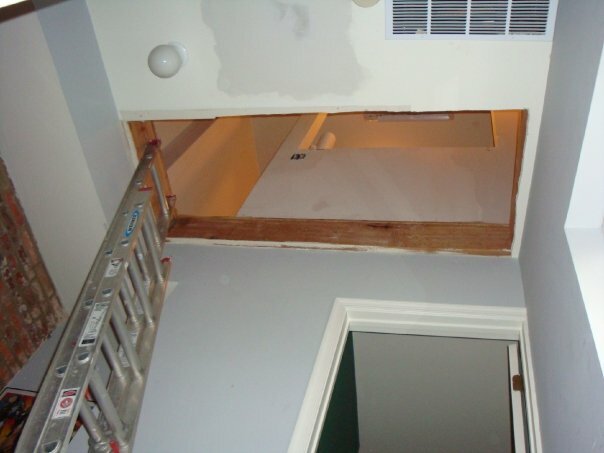 I was going to help him with this attic, and he, whether he knew it or not, was going to help me define a key element of the business plan I was working on. With John’s commitment, and through the ideas and execution of some outstanding pros, we pulled off a fully functioning home office/hide out. Here are pics and some props. We knew going in we would address the attic stairs, we would install a bookcase in an alcove created by the peak of the roof, and we knew we wanted to try to conceal the furnace. (All of which would require custom woodwork.) We knew we needed phone, cable, and additional electric up there. 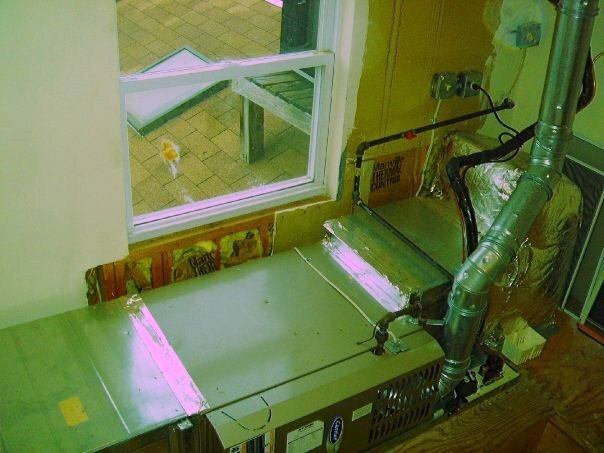 Early on, too, we decided that we wanted to install a dedicated split system air conditioner in an effort to take some of the load off of the whole house system. Step two, install the dedicated mini split. For that guy, and this is the power of the internet, I will write his name here only after he comes and does the service check he promised us some 14 months ago. We placed the air handler on an inside wall (above where John’s desk now sits). 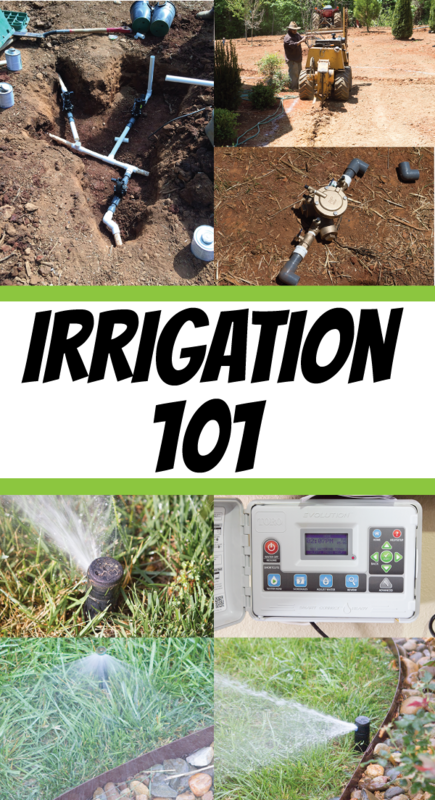 We ended up doing something pretty cool with the refrigerant and condensate lines — I posted on this earlier — Building a Chase for Split System Air Conditioning Lines. 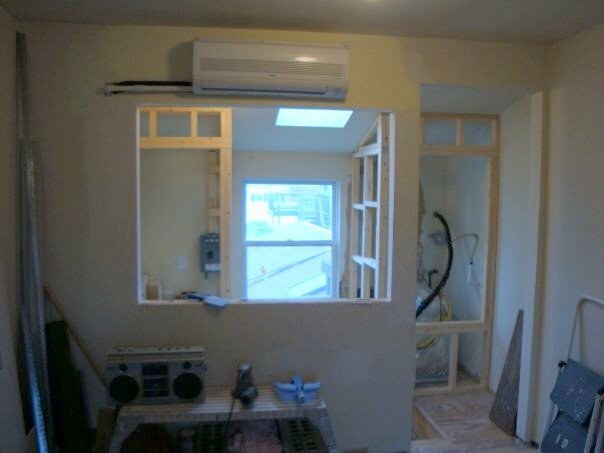 Step three, spec and prep for built-ins. To start, I suggested that John pick up a Built-In ideas book. The one he choose was called the New Built-Ins Idea Book by Taunton. From this, he was able to determine that he wanted maple cabinets, stained Early American, with raised panel, full-overlay doors. 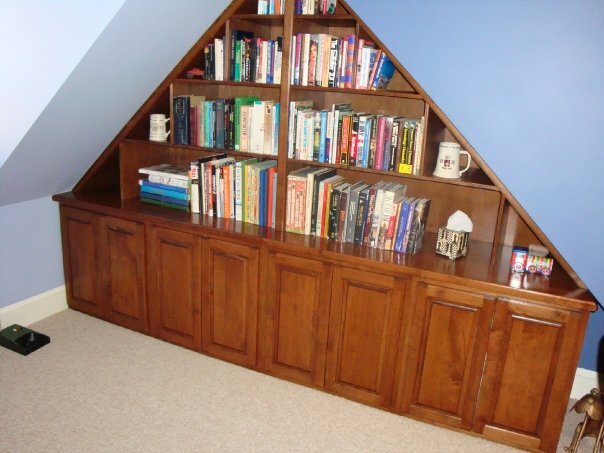 We knew we wanted to do a bookcase, with storage below, at the peak of the roof. But we also needed an enclosure that would neatly hide the home’s mechanicals. 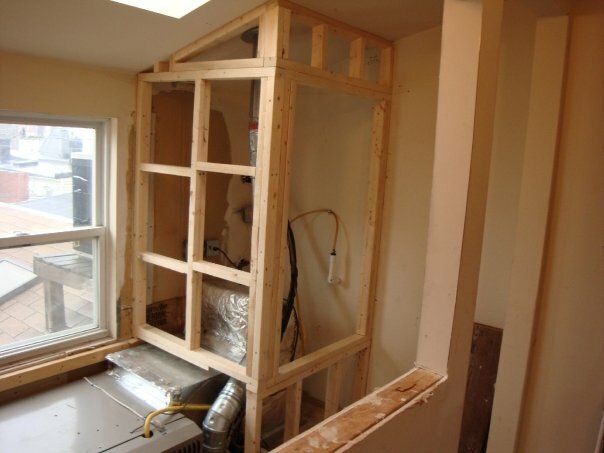 For this, and with servicing this unit in mind — we framed around it using 2x3s. Our cabinet guy, Steve Van Meter of Steve’s Custom Cabinets, came in and applied panels to our framing. John later detailed the front of the enclosure with decorative brass grills (like the one you would see on a radiator cover). Step four, with work progressing (John and I did the trim and drywall work ourselves), it was time to spec out and find someone to build the custom stairs we needed. I made calls on this, but with little luck. Then, I turned to John Neiswender at Precision Millwork and Carpentry. He too came out and just got it done. (You can see what we came up with below.) It, too, is in maple, has an integrated grab bar, and allows for permanent access into the attic. 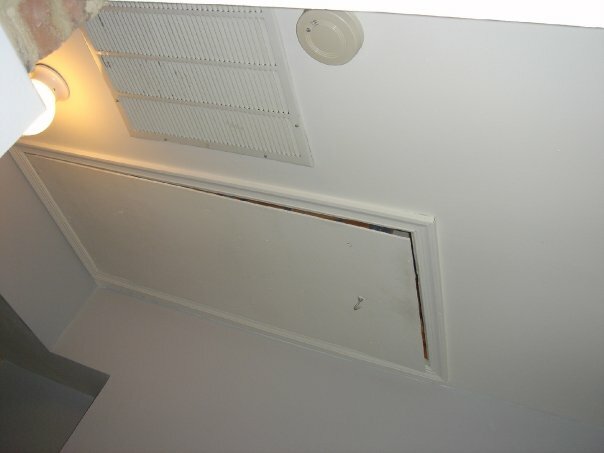 Later John N. fitted the opening above with a sturdy sliding door that when closed allows for service of the heating unit when work is needed. John S. himself uses this platform to access storage at the far end of the enclosure. Step five, carpeting and other details. John coordinated the carpeting of the whole house. Before this, he went through and punched out the subfloor throughout. Later he hung a hi-def TV and finished with some of the furniture you see below. We did this thing together. John was involved and engaged at every step of the job. From that, I hope that he got pretty closely what he wanted. I think he learned a few skills along the way (or least who to call when he needs to borrow a tool). Sure, there are some, “coulda, shoulda, wouldas”, but what I see — is a space elegantly finished, at a price that allowed him to upgrade some of the key features. On site built-ins and stairs turned into custom cabinets (installed the way he wanted), a custom set of stairs, and a custom door on the attic opening. Anyway, thanks John for letting me participate; it was a pleasure. Please see our category Remodeling for more inspiration and ideas. Built-Ins Idea Book by Taunton Press: New Built-Ins Idea Book (Taunton Home Idea Books) on Amazon. 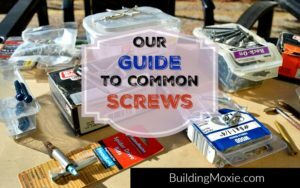 A one-time construction manager, and always handyman, turned blogger and editor. My wife, Jen, and I are on our 9th property (. . . yes, together). She is a real estate agent. We have two beautiful daughters Evyn and Eva. We recently traded in our now restored 1889 farmhouse in Baltimore's Lauraville area for our next adventure - a 1920s Dutch Colonial in nearby Towson. Thanks for reading; please comment ... or email anytime [email protected]ldingmoxie.com. You'll find me on Google Plus as +jb bartkowiak & on Instagram as jb_buildingmoxie.